A step-by-step guide to home decoration. Move into a new apartment after arriving with only the items you took with you on the plane. Arrange clothing as a mattress. Change in the bathroom since it’s dark and you don’t have curtains. Realize there are no window coverings at all – not even a curtain rod. Realize you’ll have to get curtains. Get distracted with other things: buying groceries, obtaining furniture, unpacking your boxes when they arrive via Greyhound. Allow days to pass. Continue to think about the curtain thing. Go to stores and look at the window covering aisles. These are big stores, with acres of indoor space, where you could wander for a long time before finding what you’re looking for. Be glad the signs explaining what’s in each massive aisle also have English on them in small letters. Be glad that sure, you might only fluently speak one language, but thank goodness its English which is everywhere. Leave the stores. Don’t buy anything, distraught at the amount of packaging, at all the little metal and plastic bits and pieces that were manufactured when there are perfectly good window coverings in landfills. Go to the Salvation Army. Take the bus. Find a lamp, a container to put by the stove for long-handled utensils, a few other things. Look for window coverings. Be disappointed there is only one plastic blind contraption that will in no way cover the two nine-foot expanses of window in your apartment. Continue to change in the bathroom at night. Or, lay out your pyjamas on the bed, then turn off the light and change so no one across the way can see you. Do this for a few more days. Go back to the store. The one with the biggest aisles. Find a contraption you hadn’t seen before. With not too much packaging and little metal bits that our precious resources were used to make when there are perfectly good window coverings in landfills. Pick up two of them. Consider the price as reasonable. Think about shopping for curtains with your ex. That time you had a huge fight and walked out of the store buying nothing. 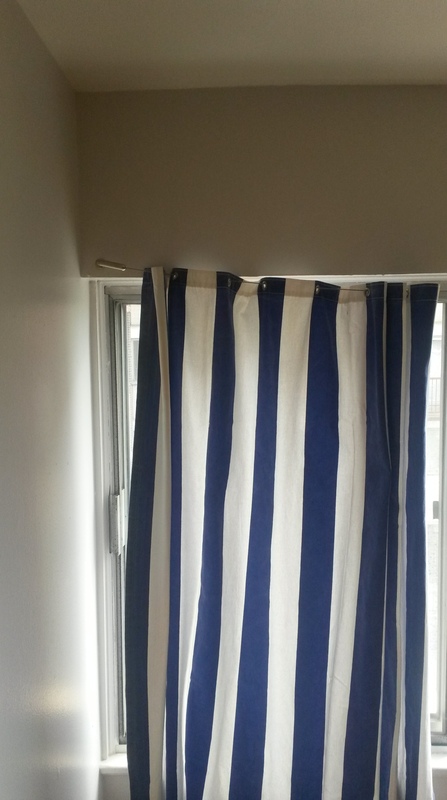 How you just needed some goddamn curtains in your goddamn living room to block the view of the space in the house between the bedroom and bathroom. Think about how you didn’t ever end up getting curtains, but just moved the furniture around. Be glad you now would better be able to stand up for yourself and be clear with what you needed. Wonder if he ever did put up curtains. Look for garden products to start your garden. See bamboo poles for $1.99 and reconsider the curtain hanging contraptions, whether the price actually is that reasonable. Attempt to begin putting up the contraption. Curse the fact that you don’t own an electric drill to actually install it. Attempt to make a hole in the wall with a combination of a nail and screw that you hammer in with a shoe. Notice how the neighbour upstairs stops playing the piano when you begin to use your shoe-hammer. Continue installing the curtain contraption. Reach an impasse. Be unable to cut the wire the right length. Try to use a scissors. Google if there are any better ways to cut wire without a wire cutter. Give up—all of your kitchen chairs are now employed as a walkway along your window to reach the height of the curtain contraption. Think you need help, that you can’t do this on your own, that you’re trying your best but it’s clearly not good enough because you can’t even hang some goddamn curtains to cover your goddamn windows. Consider asking the guy you went out with the other night to come over and help you. Notice the pattern your mind wants to play out of going to others instead of relying on yourself. Realize that it would probably give the wrong impression and decide against it. Use your office chair when you eat meals at your table. Change in the bathroom at nights. Go back to the Salvation Army. This time, walk. Find curtains to hang on your contraption should you ever get it up. Pack them into your backpack. Walk home. With renewed purpose go back to the large-aisled store. Buy a hammer. And a wire cutter. Come home, cut the wire. Tighten it onto the secured mount on the wall. Be surprised when it falls apart. Continue to eat at the table using the office chair—all other chairs still being used as a walkway along your window. Have a realization. Switch which curtains you were planning on putting in the bedroom and living room. Have this be somewhat meaningful, as if it tied together all the struggle and the failed attempt when it fell apart. How it just needed to be done a little differently. Put up the curtain again. Notice how it doesn’t fall apart this time. Know it’s not a perfect job, but that you did it on your own. Nadine says, ” That was funny”. It made us laugh.